Events have rather overtaken me since DD and her husband took the grandsons home last Sunday, and the thinking time I was hoping to have, to reflect properly on our pilgrimage to Assisi, has disappeared without trace. I haven’t forgotten my promise, but it will have to wait a few more days, I’m afraid. This is partly because DH and I are gearing up for our annual visit to France, to southern Manche in Normandy to be precise, close to the border with Brittany. One fateful Sunday afternoon, at the end of the last millennium, I happened to read an article in that day’s newspaper which turned out to have seriously far-reaching consequences for DH and me. 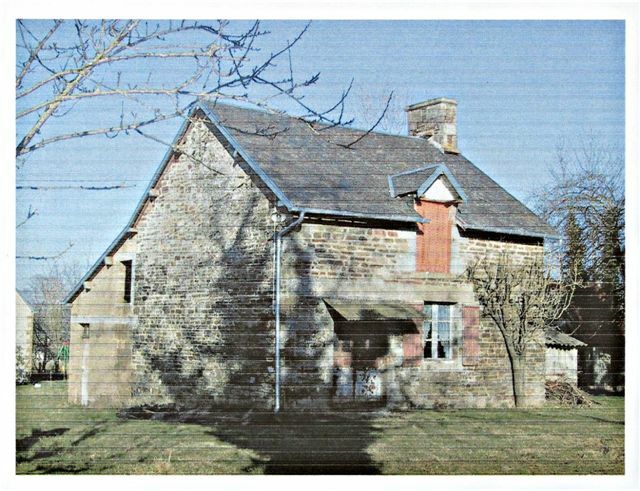 It was about the growing number of British people who were snapping up houses in rural France at bargain prices, such bargain prices that it looked like this might even be a possibility for us too. I started to daydream about holidays in France in our own little cottage, though I must admit that DH’s eyebrows were very sceptically raised at that point. As I have described elsewhere, he tried very hard to dissuade me and even bought a tiny campervan as a substitute. That worked for a few months, but, as it turned out, the second long trip we had in it was the following year, during a cold, wet and windy week in February. DH had surrendered and we were on a house-hunting expedition to southern Normandy. Not only was the ferry crossing cheaper at that time of year, but we reasoned that if we liked a place under those conditions, we would love it in summer. During that week we looked at an interesting collection of houses, some habitable, but extremely small (our budget being equally miniscule) and some not much more than four walls and a roof. Then we struck gold. In a small market town we went into the local estate agent’s office, to say that we had changed our minds about the house he was due to show us and did he have any others within our budget. He had two, one impossible and one which we knew, as soon as we saw it, could be the one for us. ﻿﻿﻿It was small, but not too small. 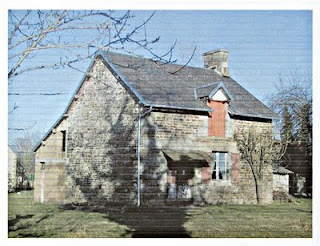 It was totally unmodernised, but had recently had a new roof, the old one having been blown off in the great storm which ravaged much of western France in December 1999. Best of all, it sat squarely in its good-sized patch of ground and was affordable. We knew we would have an awful lot to do to make it properly habitable, but that didn’t matter. After a long evening’s discussion in the campervan, we went back first thing next morning to see the estate agent and by the end of that day we had signed the compromis de vente, the promise to buy which is the first part of the French system of house purchase. Today the grandsons went home after a really enjoyable visit (for us, and hopefully for them) and I’m now recovering with a nice pot of tea and a gentle browse through the photos we’ve taken this week. After the rain-sodden Bank Holiday weekend the weather improved rapidly and we were able to go out to show them the Mid-Wales countryside, so different from their home area in the flat plain of the southern Vale of York. On Thursday afternoon, while I was otherwise engaged, DH took them to visit the wind-farm on the hills across the valley from us. Mid-Wales is home to an increasing number of wind-farms, and the rate of growth is proving to be more than a little controversial. For what it’s worth, DH and I don’t have a problem with this, but I realise it isn’t a view shared by everyone. This particular wind-farm is one of the longest-established in the area, and when it was opened in 1993, it was the largest in Europe. By today’s standards, however, its output is modest and it is due to be rebuilt, but the present turbines still managed to awe our two talkative grandsons into silence. On Saturday, after we had been joined by DD and her husband, we went to visit one of my favourite local beauty-spots, in the heart of the Hafren Forest. The forest takes its name from Afon Hafren (River Severn) which rises less than a mile outside its western boundary, high on the slopes of Pumlumon, the highest mountain in Mid-Wales. After our picnic lunch we went for a wonderful walk alongside the infant Severn, which at this point on its journey to the sea tumbles over a series of small, rocky waterfalls, known as the Cascades. Years ago the Forestry Commission installed a board-walk along the boggy river-bank, to enable even those with limited mobility to enjoy this extraordinarily beautiful spot, as well as waymarking a series of walks through the forest to satisfy all levels of energy and fitness. DH and I contented ourselves with a modest stroll, and while DD and her family went off for something a little more strenuous, we walked back to the boardwalk to sit by the river and contemplate the beauty to be found so very close to home. Once I've tidied up after the visit and gathered my thoughts, I will share more of my trip to Assisi with you, but until then there is something eternally restful and constant about the ever-changing flow of a river.